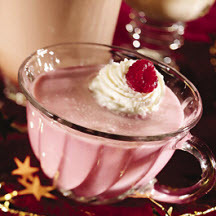 This beautiful, sparkling berry eggnog punch is so good, expect to be asked for the recipe. In a pitcher, stir together juice, eggnog and soda; mix well. Pour into cups or small glasses. Garnish with whipped cream and nutmeg.